Clapboards are one of the most popular kinds of exterior siding, and have been for generations. Clapboards are one of the most popular kinds of exterior siding, and have been for generations. They are often made of cedar, but not exclusively, and generally measure 1/2" thick and 6" wide, in varying lengths. Generally clapboards are installed so that 4" of the total 6" material is exposed to the weather. Each course overlaps another course by 2". Pre-primed Clear Cedar: This is the top grade of cedar siding, already primed for you. This product does need a topcoat of paint, but you are saved the step of priming it yourself. Clear Cedar: This is the top unprimed grade of cedar siding. It looks great, with its tight vertical grain. A coat of semi-transparent stain brings out the beauty of this product, and the grain also helps minimize warping over the years. Solid stain also can add to the appearance of this siding, depending upon the look you want. 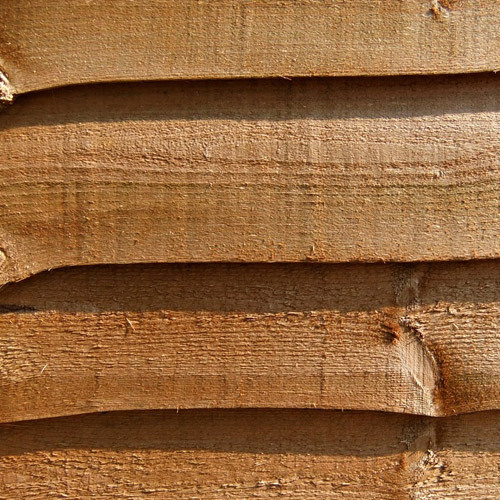 Cedar Ayes: This is the midgrade cedar siding, with what is called a flat grain. The grain does not have the same close, parallel look of the clear vertical grain (CVG). Most often, this is used with a solid stain or a paint. (More on Paint versus Stain.) It is still an attractive siding, and is less costly than the clear. Finger Jointed Primed Cedar: This is another grade of clear cedar, but instead of single, solid pieces, the clapboards are pieced together with fingerjoints. A fingerjoint is a way to glue together two pieces of wood so that they almost seamlessly become one piece. This allows the mills to create pieces without knots or irregularities, and to sell longer lengths (a good thing when you're covering a wall). These clapboards are then preprimed, so that installation is fast and easy. Pine: We also stock pine clapboards, and they are the least expensive of them all. These must be taken care of more than the cedar, though. Pine does not have the same level of natural resistance to weathering as cedar. Pine has pitch to help it resist weathering, but the pitch is not quite as effective as the tannins that are in cedar. Pine can give a house a more rustic, colonial New England feel, though, and it accepts stain and paint very readily.